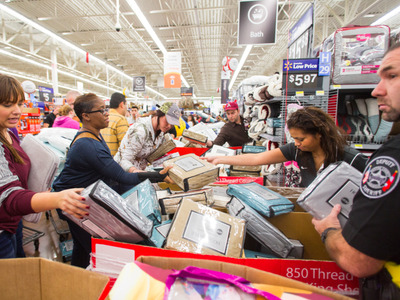 Theft is a huge problem for Walmart, costing the company billions of dollars every year. Walmart has made it a top priority over the last year to reduce stealing, in part by adding security detail and bringing back greeters to store entrances, but the problem persists at stores nationwide. In Tampa, the local police department has been so overwhelmed by calls to Walmart stores that the company has implemented a new “diversion” program to give petty offenders a slap on the wrist instead of jail time, The Tampa Bay Times reports. The program allows first-time shoplifters who steal less than $25 to avoid criminal charges. As punishment, the offenders must take a class on retail theft and pay restitution. The program has helped alleviate police calls to Walmart stores. The number of arrests at one Walmart Supercenter in Tampa — which has historically been a hotbed for criminal activity — was reduced to 47 over the first four months of this year, compared to 85 arrests over the same period in 2015, according to the Times. Calls for police help also declined, from 486 in the four-month period last year to 294 this year. But the local government still isn’t happy with the level of criminal activity at Walmart stores. According to a Times investigation, police were called to Tampa-area Walmarts nearly 16,800 times in one year, which equates to two calls an hour, every hour, every day. Tampa City Council member Frank Reddick said Thursday that Walmart should hire security guards at its stores. He said he met with Walmart officials earlier in the month at a store in East Tampa where more than 120 arrests were made in the first four months of the year.